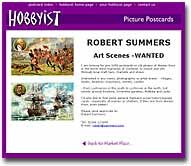 Hobbyist also aims to provide collectors, clubs and dealers with a range of advertising solutions our low cost 'Basic Hobbyist page' is an ideal way to get yourself on the internet and you don't even need a computer. All ads are fully linked into our page sections and you even get your own web address! You can also change or add to your advert during the year if you wish, small alterations and additions cost from just £5.00 up to the full ad. price. with your own banner link. The optimum banner size is 466 by 60 pixels, (<30k) Graphics should be in the form of good quality artwork for scanning, or GIF or JPEG files. Animated and rotating banners are acceptable. Banners may be hyperlinked to your own web site. 600 words max - if supplied in electronic format, disk, email etc. Post us photos/ artwork or send scans by email. OR FOR JUST A LITTLE EXTRA..
also available - Multipage solutions, Complete website design, Domain name registration and fully featured site hosting.